You’ve probably spent a lot of money on your long-lasting roof and you take the time to maintain it correctly. But have you spent much time thinking about your roof’s ventilation system? Newer homes are built to be as efficient as possible, and a good builder puts some effort into making sure the roof is ventilated enough. Older homes are seriously lacking proper ventilation and, for the best efficiency and effectiveness, you’d be wise to increase ventilation. 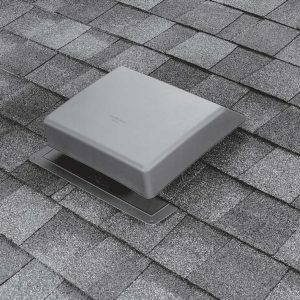 Here’s a quick primer to why house roof ventilation should be on your next home maintenance to-do list (contact us for more information). We’ve all heard about the natural phenomenon that “heat rises.” We don’t always contemplate how that works in our homes, however, especially as it relates to our roof. Our modern houses are ultra-focused on efficiency and keeping the heat in our homes. And so we keep our efficient, double-paned windows closed and our walls thoroughly insulated. We buy highly regulated heating and cooling systems, and find ways to use passive solar effectively. But, inevitably, heat does rise and collects just under our roof. This is a problem because of how it unevenly heats up the underside of the roof, causing ice damming and other issues in the winter. It’s also a problem because of another factor: moisture. Humans breathe and sweat, letting water into the air. Our activities, like showering, cooking, and cleaning also release water into the air. Caught in the heat that is rising, it travels up to the roof collecting on the rafters in the attic. With enough moisture and heat, it becomes a sauna up there causing problems to the wood. Rotting, buckling, warping are all issues associated with this phenomenon. And they’re all things you don’t want to have happen to your roofing structure. The solution is to create a way for moisture and heat to escape through the attic or roof. Ventilation turbines are one option, though they are higher maintenance over time. You can easily have a dormer ventilation installed at the back of the house, allowing the heat and water to escape quickly and easily. It’s a smart choice that can save you lots of money and hassle in the long run. If you’re ready to make your roof more efficient and effective, reach out to Turner Roofing for a professional consultation! ← What Are Double Pane Windows?